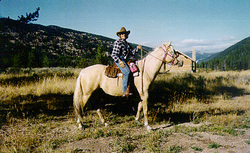 Alice Creek Ranch is a working ranch with guest facilities for small groups. We offer a luxurious guesthouse and two rustic cabins for summer accommodations. We have a variety of outdoor activities. Summer activities include horseback riding, hiking, fishing, and mountain biking on meandering trails. Or feel free to help us in everyday ranching activities including cattle drives, fencing, spring branding, feeding horses and cattle, and other everyday chores. Nearby points of interest include Gates of the Mountains and Garnet Ghost Town. We want to show you what we love about Montana! Please call 406-362-4810 for reservations and package prices. Directions: Alice Creek Ranch is 8 miles east of Lincoln off Highway 200. Turn onto Alice Creek Road and travel Alice Creek Road for 5 miles to Ranch.